The colors in this scene were fascinating. 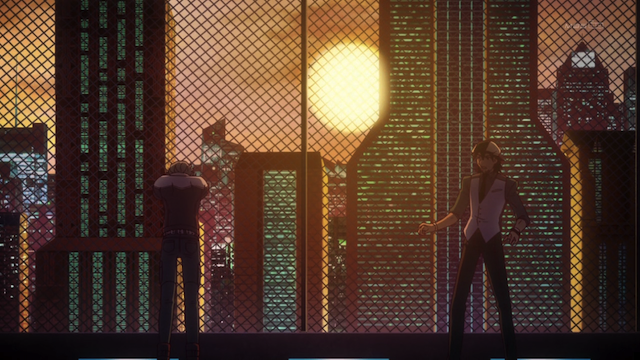 I know I said that I wasn’t going to bother blogging Tiger & Bunny, but the scene from episode 18 that you see in the screenshot above was so impressive, I just had to say, “Wow”. The issue wasn’t the emotional impact, although I think it came across well. I was really impressed by the use of color. That having been said, I might as well comment quickly on the rest of the episode. Kriem, as expected by many, denies that Jake was the murderer of Bunny's parents. Bunny, looking very depressed, tries to give Tiger a chance to speak his mind. Obviously Tiger was going to go back on his word about quitting and moving home right away. I was surprised by how understandable this turned out to be. Bunny seems to be breaking down mentally; the guy can’t even trust his own memories anymore. Is it right to just say, “well, I’ve got my own problems, so I hope you work it out,”? What would a hero do? Of course one could also say that Kotetsu has made his situation worse by not being open with people from the beginning. 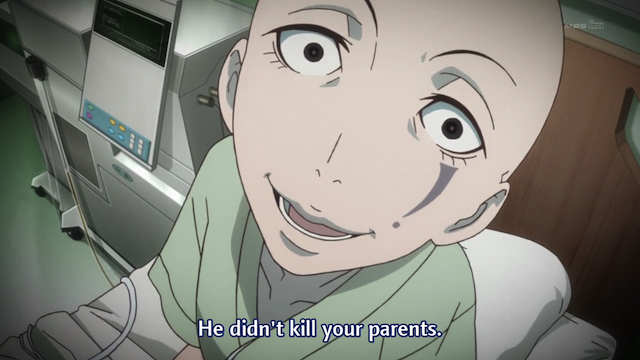 He never told Kaede what he does, which makes it difficult to explain why he can’t return right away. And he never told Bunny, or any of the others about his powers fading, so they aren’t making it easy for him to quit. Although I’m not regularly blogging this show, I have to say, they are doing some good things with the personal stories behind the superhero battles. Wild Tiger has been a very sympathetic, if flawed, character right from the beginning. I really hope they end this show strong. Man you called it. 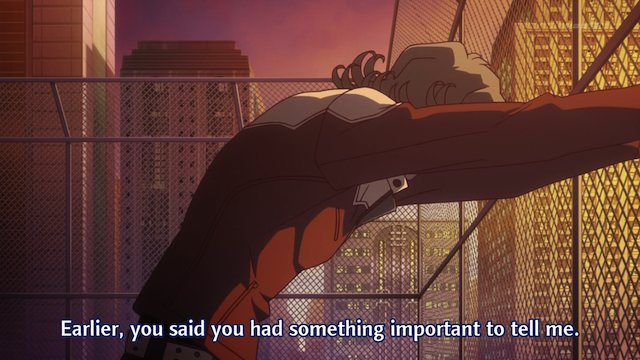 Kotetsus reluctance to be open about his own problems is certainly one of the central plot devices for this anime. I’m really happy that there is something to chew on, besides the superhero adventures. Kotetsu really makes this nike for me. One might even argue that because he is flawed, he is easy to sympathize with. Who ever sympathizes with people who are perfect? Tiger’s problems are easy to understand – even if we aren’t superheroes with their powers fading away, the experience of having to hide something from people is one we all know, as is the frustration when you just can’t do what you want to do because doing what you want to do would make other people sad. Not quite sure if I make sense.